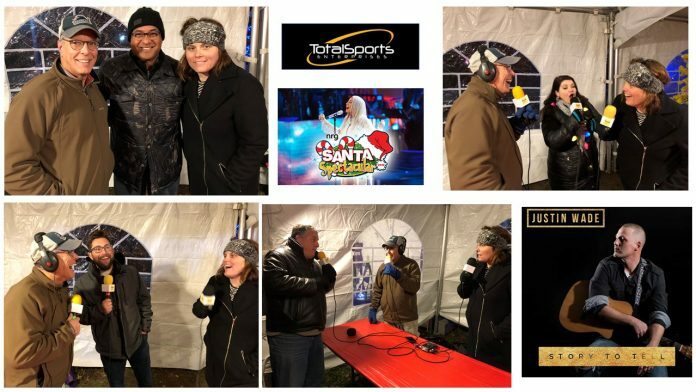 Summary: John and Rachael walked from a parking garage on Penn with gear and equipment in hand to sink in mud…..and have great interviews at Santa Spectacular thanks to Entercom. The trek was worth the haul since we learned that Roberto Clemente, Jr is a story teller, athlete and inventor?! Plus, we chatted about the Pittsburgh comedy scene and John’s habits with his son Collin Chamberlin, Missy Moreno’s new comedic adventures and teaching stint. We also heard from a slightly angry elf on the shelf, caught up with Pete the Car Man and heard the tunes of Justin Wade Band. Listen to the podcast by pressing the play button below. If you don’t see the play bar, above in your email, click the one below to take you to listen while you prep your tofu turkey! SPONSOR: Total Sports Enterprises knows sports and signings. Black Friday is only a few days away, so be sure to click on tseshop.com for deals and sports steals from all of your favorite athletes. Plus, you can stop into Total Sports at the Mall at Robinson to decide on how many deals you need this holiday season. Visit tseshop.com for up to date signings and savings. WHAT WAS ON THE BLOG? Squeezing in parking spaces and Kiya Tomlin preparation were big hits. Question of the day: What is your favorite holiday memory? 3:20 Angry Elf On the Shelf: Rachael gets her first dose of the Elf on a Shelf who is a little perturbed with sitting and the holidays quite frankly. She calms down as she chats through her holiday experiences. 8:23 Roberto Clemente, Jr: The son of a legend is legendary in his own right with his story telling, athleticism and new experience as a father himself. We are lucky enough to hear childhood anecdotes, find out Roberto Senior’s other profession and learn why Pittsburgh is home again for Roberto Clemente, Jr. Follow the Roberto Clemente, Jr. Insurance Agency. 36:32 Collin Chamberlin: A visit from Collin entails comedy cuts and reflections of daily living in the Chamberlin house. He is certainly becoming the go-to comedian in Pittsburgh and other cities for that matter, plus we find out his humorous Christmas memory. www.CollinComedy.com. 48:05 Pete the Car Man: It is not new news that John is in dire need of a new vehicle and Pete the Car Man walked by the TSE booth at Santa Spectacular at the perfect time! John learns what tips are best when buying a new used car! Listen up! BandPMotors.com, Glenshaw! 52:03 Missy Moreno: After parking at Point Park, since it sounded like Point State Park, Missy had her own trek to the podcast. She talked about her new teaching role and continued classes and stand-up at the Arcade Theater. She’s had many cameos on the podcast, what is her newest? Follow that craziness at www.MissyMoreno.com. SPONSOR: Total Sports Enterprises: Total Sports Enterprises knows sports and signings. Black Friday is only a few days away, so be sure to click on tseshop.com for deals and sports steals from all of your favorite athletes. Plus, you can stop into Total Sports at the Mall at Robinson to decide on how many deals you need this holiday season. Visit tseshop.com for up to date signings and savings.
. Thanks to Colin Parrish for the pics! Thanks to Amy Mauk & Entercom as well as the Talent Network, Inc for logistics! How Was “Hamilton,” You Ask?